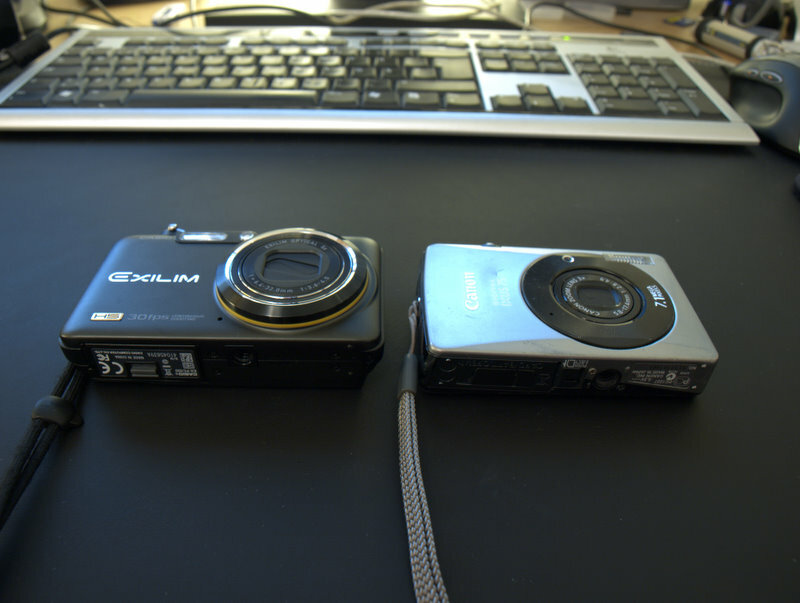 I decided to get a new camera as my old camera was becoming glitchy and awfully worn. Like normal I set up a large table of models I were interested in and weighted the pros. and cons. that were apparent. Then I spend time reading reviews and looking for sample images for the top models I picked. Finally I go to a store to actually hold one and optimally get to try it out. Sadly for the store I was at they only had the display camera left, and I would not get a rebate on it, so I checked around in other stores but finally ordered it online, like with most other things I buy. A number of playful Best Shot settings, like Move In, Move Out, Multi Motion, HS-Night scene etc. 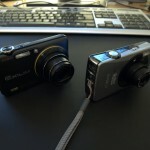 High resolution snapshots while recording in HD/STD. Focus tracking, it is flimsy in low light situations but fun when it works. The yellow ring around the optics… yes I mention it. 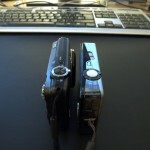 The flash is a distance from the optics, not completely flattening out images when using it. Flash intensity can be adjusted. Manual focus, though it is a bit hard to use in low light situations due to the noise level in the zoomed area on the screen. Ease of access for exposure adjustments. Overall the menu interface is very quickly to access and easy to use. It did not take long for me to feel natural changing settings even though I swapped to a different brand camera. The [Slow] button is pretty useless. It is easy to access, but lacks utility. It can only save one picture from the burst you recorded, so it feels more logical to use the continuous shoot mode where you can pick all of them if you want. The only reason it could be useful is because it has its’ own settings. 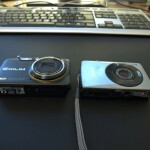 It uses a USB cable for communication but the camera port is proprietary. White Balance messes with my head. Sometimes when using the screen as a viewfinder and the white balance looks great the resulting picture can still get tinted blue or red, not at all looking like what I expected, which is a bit discomforting. My guess is post processing of contrast, color etc. I am wondering how dust proof this camera is. My old one has been in on so many adventures it is stupid, and has no dust inside the screen. Only after a few weeks this camera has a big speck of dust inside the screen making it look like a dead pixel when turned on. I guess it might come from the factory? If not I do not expect a long life for this camera. Sometimes when I have just turned on the camera and it has not charged the flash and I press the shutter button it will act like it is taking a picture, blanking the screen, but it actually does not! There is no image saved. HD movie recording has fixed focal ranges completely ignoring where you set the auto focus. Let us use the auto-focus for all video modes. When using the 30-210 fps video mode there is no sound recorded when filming in 30 fps, which drags down the value of that function. It is still useful as you avoid any lag when switching to high speed, which is very nice. Switching to continuous shooting mode resets my focus area setting, setting it on spot instead of tracking. Add more options for the left/right buttons. Focus, AF Area, Flash intensity. It would also be nice to have separate functions for left and right. When retracting the lens it now zooms out and then retracts. 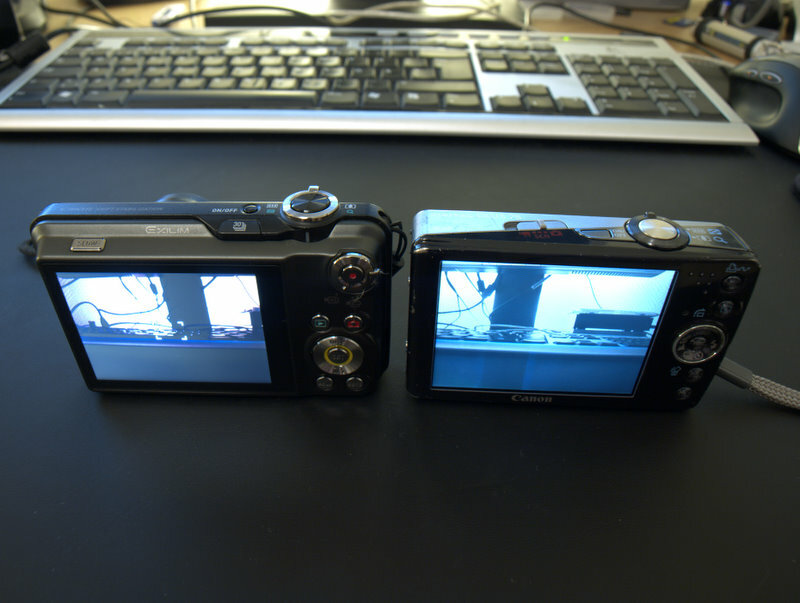 It feels like both things should be possible to do at once, like on my old camera, to decrease the time it takes for the optics to retract. Now I wonder if it is really shutting down as the zooming out is internal and thus is a bit hard to notice from behind the camera. The optics retract too quickly, after just ten seconds, when reviewing what you captured. It feels a bit pointless when it retracts just before you planned to take the next picture, it has happened to me several times. A small increase to 15 seconds would work for me! Make it a setting! A time-lapse or sequential exposure mode. Really, it is awesome fun and should be included in every camera. This hardware might be focused on high speed, but I would rather have it be a general time modification camera where time-lapse would be an obvious inclusion! In addition to Move in and Move out triggers, add a sound trigger, as the camera has a built in mike and pre-record features it is a sealed deal already! Rethink the need of two mode buttons for review and record. A single button for toggling review would suffice and generate less confusion. Now there are three buttons with which to turn the camera on! You can deactivate the possibility to turn on the camera with the mode buttons, but then you cannot boot the camera in review mode. Use a standard mini-USB port, proprietary ports are a pain. Change the knob on the zoom so it does not stand out so much from the body. Right now it is not very pocket friendly. The buttons feel a bit flimsy and plasticky. The lanyard was way too short for my own hands, I had to use the one from my old camera. The battery hatch has a weird plastic locking mechanism, it makes it overly complicated to get the hatch closed again, but I guess it is safe? The memory card is hard to remove due to it being right next to the hatch hinge. The battery is spring loaded, but the spring is so weak that I still have to fiddle with the battery to get it out. My most common settings, Focus and Flash modes, have no quick buttons. See firmware suggestion. If you add a time-lapse mode also add support for an AC power supply. Learn how to cut movies on the camera to save space, just press down on the directional pad in a paused clip. This is especially useful with highspeed clips with a long lead time. Beware though that this changes the timestamp for your movie! To use your own focal point when recording HD/STD video you need to change the focusing mode to manual after auto focusing or else it will switch to the fixed focal points. Naturally you can also set the focal point directly in the manual mode. To avoid getting kicked out of the menu when saving settings with SET, just press left on the directional pad instead and you will save that setting and end up in the menu again! If you are in a sub menu, like language settings, you can exit to the menu by pressing the menu button. I actually saw this as a complaint in several reviews before I bought the camera, which makes me wonder how much detail they go into when reviewing. Am I still happy that I bought this camera? Oh yes. I have had a great time so far with the high speed features, it is very interesting to record whatever you come across in slow motion to see if you can find details you otherwise would not have noticed! A very nice thing to experiment with if you get bored anywhere :) It also feels fresh to always carry a camera that can record in 720p. Sure there are a bunch of things I would have done differently, but right now I do not develop or manufacture cameras, and nothing so far is a deal breaker. 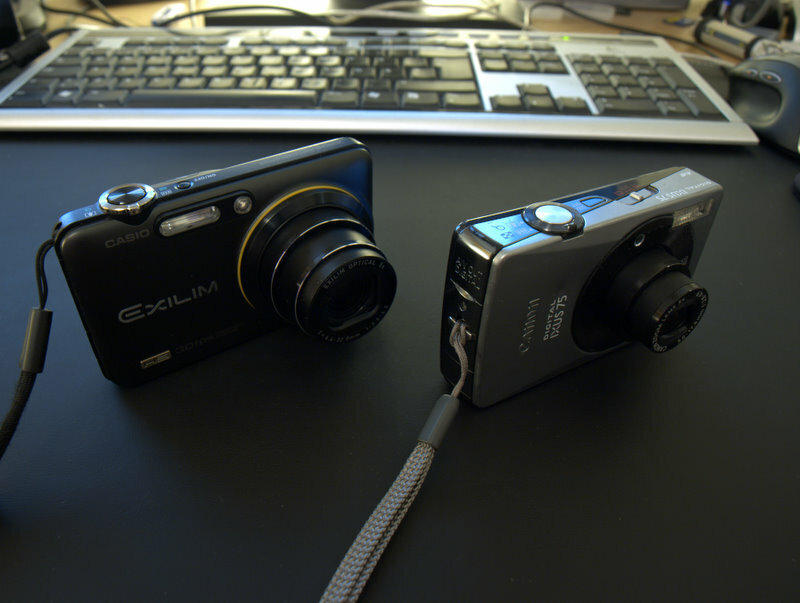 The Exilim is actually not that much larger than my old camera, it still fits into my old camera bag without problems. 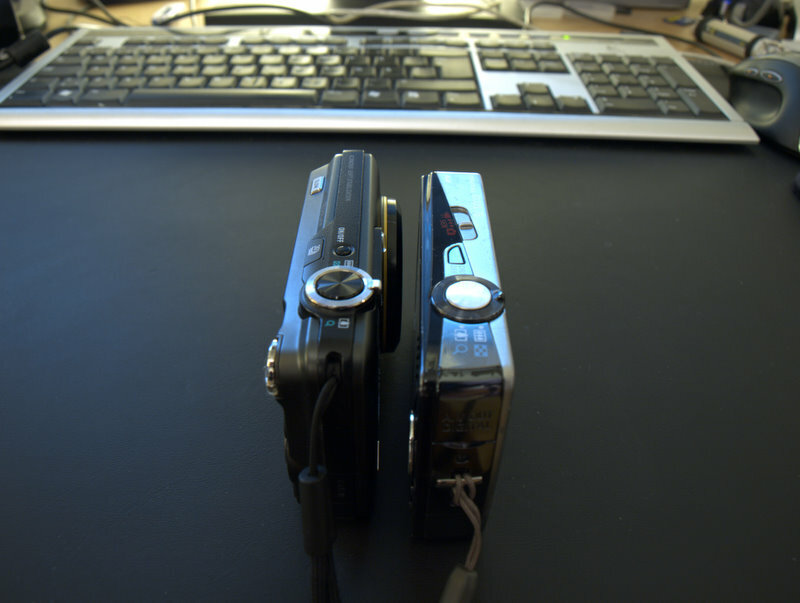 It is not as slimmed as it has things protruding from the chassis while my Ixus pretty much is a metal box with flat sides. You will see images and videos from this camera on this blog in the future, as it has replaced my Ixus as the camera I always carry with me, as a starter I am embedding a street performance a friend did a while ago recorded solely on this camera, also available at YouTube.com. The HD footage is a bit shaky as I recorded it while zoomed, but it is watchable. This entry was posted in Stuff and tagged Canon Ixus 75, Casio Exilim EX-FC100, Gear, IRL, Olympus E-410, Photos, Review, Video. Bookmark the permalink. I have the same camera and suddenly it started to lose the language, date and time every time I power on. 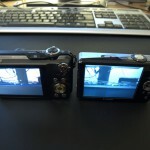 Following some internet suggestions, I erased the firmware (I think), since the camera does not start. Dou you know how to get a copy of the original firmware? I have looked everywhere with no luck. Ouch, Felix! How did you even erase it? O_O Normally I’d think you cannot install firmware without firmware already being on the camera unless you can write directly to the internal memory. Most times I hear about flashing the firmware it seems like if you mess up, you cannot fix it yourself. The best idea might be to see what can be done by an actual repair center. Not sure where or if they exist though. Myself I would probably being with contacting Casio directly on their website to see what they recommend as a solution to the problem. Good luck! 1. While firmly pressing down both [BS], [PW ON] and [UPPER], turn the power on. b) Select “3:ROM UPDATE” and press SET button. c) Next, select “5:SYSTEM INITIAL” and press SET button. d) The following message appears. e) Press SET button and System is initialized. “SUCCESS !” appears on the monitor. BUT I COULD NOT GO AFTER STEP 2, BECAUSE I RECEIVED AN ERROR MESSAGE. Dou you know how to extract the firmware to mail it to me? I actually don’t have my camera right here and even if I had I would doubt I could get anything out of it, for several reasons. As it was my pocket camera I always carried it around and as such I have worn it out since getting it :P Right now it has a hard time turning on at all, it just flashes red, but then I have thoroughly abused it, hehe. The next best thing you can do is to write up the error message you receive at step 2 and Google it. If you are lucky someone else has bumped into the same problem, and if you are very lucky, someone has also included how to fix it :P The alternative is to send it somewhere for repair, though as it’s a dated model now I’m so not sure if that’s the best use of your money. Andreas, sorry about your Casio. I will follow your suggestion as soon as I can reproduce the message again. Thank you again for your time. Felix, how did you solve the problem? I have the same problem like Felix, I think that I deleted the software version 1.0 and now I can’t find another software for EX FC 100.I still can See the code of the first soft…. i have problem with this cam. the backlamp is blinking red. and i cannot turn on this cam.